I’m on a limited plan; how can I limit traffic consumption? — Dr.Web — innovative anti-virus technologies. Comprehensive protection from Internet threats. I’m on a limited plan; how can I limit traffic consumption? 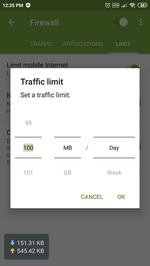 Since limited Internet plans are usually offered for a specific amount over a specific period (for example, 100 MB per 24 hours or 5 GB per month), the traffic limitation option can be configured to prevent users from suddenly and significantly exceeding their usage limits. 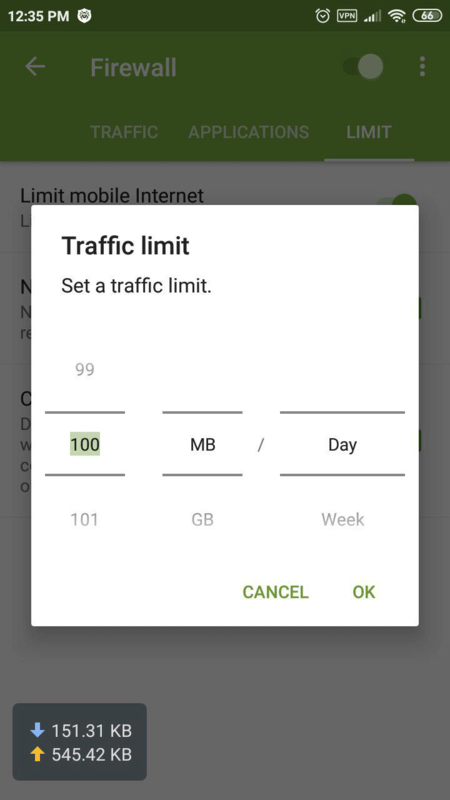 in the newly appeared window, indicate how much mobile traffic (in megabytes or gigabytes) you can use for a specific period (day, week or month), and click “OK”. you will see a window where you can specify the amount of traffic you’ve already used prior to the current moment—if you’ve already used some traffic from the current period (for example, Dr.Web was installed in the middle of the month). Specify the amount that you have used, and click “OK”. With this option, you’ll find it very convenient to receive notifications informing you that you are reaching your limit. To enable these notifications, select the “Notifications” checkbox in the “Limit” tab.